Nearly every neuron in the brain secretes a bioactive peptide [Fig. 1] along with a conventional neurotransmitter such as acetylcholine or norepinephrine. Most endocrine cells secrete bioactive peptides. Many neurons and endocrine cells secrete several such peptides with a blend of biological activities. 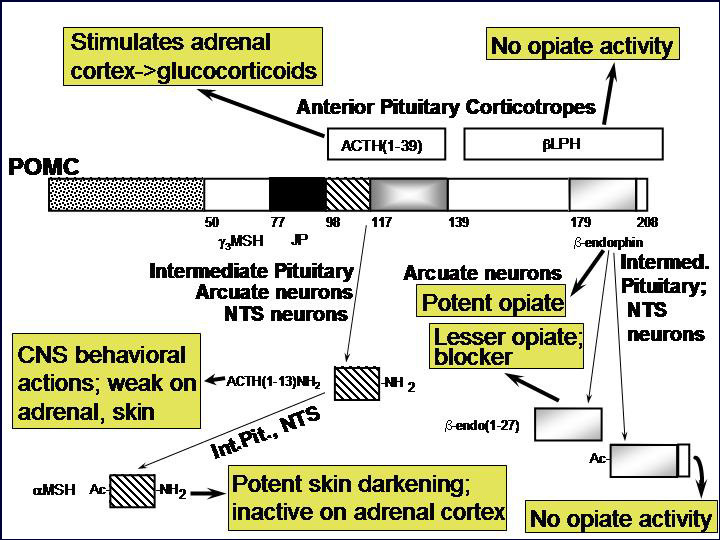 Examples include the ACTH-secreting cells of the anterior pituitary, which stimulate cortisol secretion from the adrenal cortex but also secrete the opiate peptide beta-endorphin. The sister cells in the intermediate pituitary take the same peptide precursor, proopiomelanocortin, and make a skin darkening peptide called MSH, but little detectable ACTH. And the proopiomelanocortin neurons in the brain make other collections of peptides. [Fig. 2] How do they do it? And how can the blend of peptides change during development? Why do many sympathetic neurons make neuropeptide Y along with norepinephrine? These are some of the questions that lure us forward into our studies. Peptides seem to have preceded the 'classical' transmitters as the nervous system developed - creatures like Hydra and Drosophila utilize peptides to control key developmental decisions. Beginning with our work on proopiomelanocortin and the coordinate biosynthesis of ACTH and the opioid peptide beta-endorphin [Fig. 3], we have been fascinated with the effort that neurons and endocrine cells devote to the biosynthesis, storage and regulated secretion of peptides. As we have learned more about the specific enzymes involved in the biosynthesis of peptides, we have learned important questions to ask about how these enzymes function in cells. Years ago we began with questions of 'what peptides are made in what tissue?' and then progressed to 'what enzymes are involved in peptide biosynthesis?' Now we ask detailed questions about how those enzymes function and how they get into the secretory granules to do their jobs? And we ask how the secretory granules are moved to the correct place in the cell to await secretion, and why do they wait so long before secreting their contents on command? These questions are asked using a number of model systems–immortal mammalian cell lines grown in tissue culture, fresh mammalian neurons and endocrine cells coaxed to develop in culture, knockout mouse models, a variety of cells overproducing the enzymes and binding molecules that function in peptide biosynthesis, and a number of cell biological and molecular biological techniques as they are needed to address the questions at hand. One key enzyme that has been a major focus of effort has been PAM [Fig. 4] peptidylglycine alpha-amidating monooxygenase - a copper-, oxygen- and ascorbate-requiring protein found in secretory granules. PAM has at least three functional domains, a monooxygenase that starts the peptide amidation reaction, a lyase that completes the amidation reaction, and a routing domain that helps get PAM to the right places in the cell. The first two domains are enzymes existing on the inside of the secretory granule, while the third domain is on the outside of the secretory granule. Some of our studies have focused on the enzymatic properties of the two enzymes, going as far as X-ray crystallography and other biophysical studies which are performed by our various collaborators using our proteins. We also make site-directed mutant versions of the proteins to decipher the enzymatic mechanisms. The routing domain on the outside of the secretory granule has been a recent focus of our studies, yielding several interesting binding partners through the use of the yeast two-hybrid system. So, why was it important to focus so much of our effort on the process of peptide amidation? This seemingly trivial modification to the COOH-terminus of peptides turns out to be essential for the biological activity of many peptides. Hypothalamic peptides like oxytocin and vasopressin along with neuropeptides like substance P and gastrointestinal mediators like gastrin must be amidated in order to affect their target tissues. By purifying an enzyme capable of converting peptidylglycine precursors into amidated products, we were then able to clone a cDNA encoding this enzyme. To our surprise, the modification requires the sequential action of two enzymes, a monooxygenase and a lyase. The monooxygenase itself is called PHM, short for peptidylglycine alpha-hydroxylating monooxygenase, and the lyase is called PAL, short for peptidyl-alpha-hydroxylglycine alpha-amidating lyase. PHM uses ascorbic acid (vitamin C) to reduce the two copper atoms that are bound to its catalytic core and molecular oxygen is the final component of the reaction. PAL also requires a metal ion for activity; PAL contains zinc. We have expressed the bifunctional PAM protein in soluble and membrane forms and have purified milligram amounts of the two separate catalytic domains, PHM and PAL. With Drs. Mario Amzel and Sean Prigge, we were able to deduce the crystal structure of PHM. One copper binds to the N-terminal domain of the PHM catalytic core and the other to the C-terminal domain. We have also deduced the crystal structure of PAL with Drs. Chufan and Amzel. In addition to its catalytic domains, PAM has non-catalytic regions. In particular, the transmembrane domain and cytosolic domain of PAM need not be present for the enzyme to function. The role of these non-catalytic domains seems to be in getting PAM to the right place in the cell so that it can do its job. In particular, the cytosolic domain is essential for targeting PAM to the secretory granules of pituitary endocrine cells and for guiding PAM protein that has reached the cell surface back into secretory granules following internalization. After mapping several key determinants in the rather short cytosolic domain of PAM, we identified proteins that interact with it. One of these proteins, PCIP-2 (Uhmk1) is a protein kinase that is highly selective for PAM. The Ser residue phosphorylated by PCIP-2 plays a role in secretory granule targeting and in trafficking from late endosomes into the TGN and secretory granules. Current studies are directed to understanding the structure and function of PCIP-2. Another PAM cytosolic domain interactor protein, Kalirin, is a member of the Dbl family of GDP/GTP exchange factors for small GTP-binding proteins of the Rho sub-family. The cytosolic domain of PAM binds to the spectrin-like repeat region of Kalirin, and Kalirin is especially abundant in neurons [Fig. 5]. This region of Kalirin is followed by a Dbl homology or DH domain, and a PH domain. Kalirin occurs naturally in a variety of isoforms and this first DH/PH domain can be followed by a PDZ-binding motif (Kalirin-7), an SH3 motif (Kalirin-8), another DH/PH domain (Kalirin-9) or another DH/PH domain and a putative serine/threonine protein kinase (Kalirin-12). The various isoforms of Kalirin are expressed at different times during development and are localized to different regions of the cell. Over-expression of Kalirin or its subdomains dramatically alters the growth of axons [Fig. 6] and formation of synapses and current studies are aimed at understanding the structure and function of Kalirin [Fig. 7]. Multiple RNA splicing variations give Kalirin over a dozen forms, with sets of splicing patterns which differ among tissues and between developmental time points. The gene for Kalirin has about 60 exons [Fig. 8], very similar to the related family member Trio, which was initially reported not to undergo such a variety of splicing variations. Trio expression is much more widespread in the body than is the expression of Kalirin, but Trio is indeed expressed in many neurons during early development before Kalirin 7 (“adult Kalirin”) is expressed, and is the major member of this family in endocrine cells in the pituitary [Fig. 9]. A fascinating recent finding is that different domains of Kalirin alter neuronal process growth in culture in patterns that are specific for the Kalirin domain and for the target neuron [Fig. 10]. Plasmids encoding a variety of natural Kalirin splice variants and also individual functional domains are introduced into cultured neuronal cells by transfection, viral infection, or direct injection, and the growth patterns of the cells are examined over time. Similar studies are underway using endocrine cells. The various isoforms of Kalirin are expressed at different times during development and are localized to different regions of the cell. We are using a variety of over-expression and antisense or shRNA techniques to study the roles of the different isoforms of Kalirin during development [Fig. 11] and in mature neurons [Fig. 12]. Chronic cocaine treatment of adult mice and rats produces changes in the levels of Kalirin-7 in the striatum and nucleus accumbens and produces changes in dendritic architecture, and female rodents differ in their responses to cocaine that match the differences seen in humans; we are using this system to identify factors controlling Kalirin expression and the mechanisms through Kalirin affects neuronal function.